A late-April departure offers substantial savings (early April overlaps the Easter school holidays and fares are more expensive). A mid-week departure is cheaper than a weekend flight. Tuesday and Wednesday departures are the most economical. Book in advance. Early birds are first in the queue for the best Orlando fares. We expect most schools to break up on Friday 26th March or Friday 2nd April. These weekends will be the busiest departure dates of the year. If you need to travel on these dates, don’t delay! An early booking is vital. If you’re restricted to school holiday dates, don’t worry. You can still save money with an indirect flight. The best deals are from Heathrow, but Manchester, Edinburgh and Glasgow also offer indirect flights. The journey is a few hours longer, but the savings are significant. Contact us today for advance fares on Easter 2021 Florida flights. How much do you expect to pay for your April 2021 Florida flights? Depending on your departure date, fares vary significantly. Don’t be surprised to see prices over £1200 on peak dates. Depart mid-April, avoiding the Easter school holiday, for a huge saving: you could achieve fares of around £425 per adult and £350 per child. But even departing 8th April onwards is far enough from peak dates for a good cheap fare of £500 or so. Most Florida flights depart from London or Manchester. If you prefer to fly from your local airport, let us know – we book connecting flights for a small fee. Edinburgh, Aberdeen, Inverness, Belfast, Jersey, Isle of Man, Newquay and Exeter all have convenient schedules. They connect with the Virgin and BA networks, so your luggage is automatically checked through to Orlando. We achieve good value fares without compromising on quality; we book with major airlines including United, Norwegian, BA and Virgin Atlantic. All have a reputation for excellence. Florida fares are released 11 months before departure. We check prices on release and continue to monitor fares daily. When fares drop, we book your seats. Experience allows us to predict the best price. Book in advance now to take advantage. Planning on visiting the theme parks in central Florida? An Orlando International arrival is your best option. For tourists looking to experience the south, Miami is ideal. If you’re hoping for a relaxing Gulf Coast holiday, Tampa or Fort Myers are both handy. Let us know your requirements on our online enquiry form. We can suggest the best option for your holiday. It may seem a long way off, but it’s not too early to book your April 2021 Florida flights. Book today with a deposit of £100 per person. Balances are due 90 days before travel, giving you plenty of time to save. If you need to travel on peak Easter dates, an advance booking is important. Call us on 01934 319 851 and speak to our friendly staff. We can put together any combination of flights, vehicle and accommodation for a complete package holiday. Take our April 2021 Florida holiday for example. Fly direct to Orlando and stay for a fortnight On International Drive. Car hire included. Book in advance now. All our April 2021 Florida flights and holidays are ATOL and ABTA protected. Combine car hire and accommodation with your Florida flights for a complete package at an excellent rate. Fly direct to Orlando, pick up your hire car and drive to your hotel on International Drive. We've chosen the highly-rated Rosen Inn at Pointe Orlando, but there are plenty of excellent hotels to choose from. Wet’n Wild, Pirate’s Cove Adventure Golf and Orlando Aquarium are all nearby. Disney and Universal Studios are a short drive away. If you fancy exploring further afield, the beautiful west coast beaches are a couple of hours drive. Or head east for the lively Atlantic coast and the Kennedy Space Center. 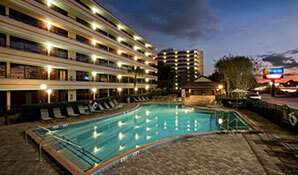 This April 2021 Florida holiday is available from £825 per person. Book on deposit. ATOL and ABTA protected.